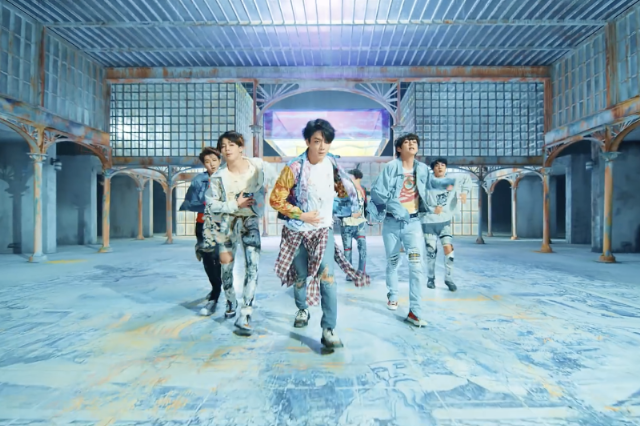 K-pop titans BTS have released a new video for “Fake Love,” the lead single from their new album Love Yourself: Tear, which is out today. The glossy video intersperses the group’s tight choreography with dramatic, CGI-enhanced scenes of shattered glass and collapsing floors, while slipping sand and abandoned toys reflect lyrical themes of dishonesty and disillusionment. Hours after release, the clip is already closing in on 10 million YouTube views. Love Yourself: Tear follows up BTS’s previous Korean-language album, 2016’s Wings, and their 2017 predecessor EP Love Yourself: Her. The group is set to perform at the Billboard Music Awards this Sunday, May 20, and in the fall, they’ll embark on a North American stadium tour with stops in California, Texas, Ontario, New Jersey, and Illinois. Watch BTS’s new video for “Fake Love” below.